Masato Sakai goes wallin' in The Wall Man. The Skinny: A creepy psychological drama about a man in a white wall, The Wall Man gets credit for getting under the audience's skin with its concept, but becomes too philosophical for its own good. J-horror goes arthouse in The Wall Man, an unsettling psychological drama that further proves that the genre can just about make anything seem creepy. Writer-director Wataru Hayakawa, adapting from the short graphic story by Daijiro Morohoshi, finds fear in a man's obsession with the titular character, an enigmatic creature that hides in people's walls and simply looks. Actually, the film is not a horror flick, but really a slow-burn exploration into the effects of media and voyeurism. As a result, the film may alienate audiences with its self-proclaimed avant-garde absurdity. Events are set in motion when Kyoko (Mayumi Ono), a reporter for a late-night fluff news show, receives a postcard about the urban legend of the Wall Man and begins to investigate. Her photographer boyfriend Nishina (Masato Sakai) takes notice of the story and begins to grow obsessed with the creature. Believing that the Wall Man is constantly watching him, he begins to take pictures of his room's white wall, thinking that somehow he will be able to capture the creature in action. Soon, he begins to leave his television on when he's not in the room - so the creature can be entertained - and he even devotes his latest exhibition to walls. "It's neither inside or outside - it's medium," the consumed Nishina tells Kyoko, explaining what the Wall Man is. Moving at a snail's pace, The Wall Man eschews a plot-driven narrative for progression, purely showing how Nishina's obsession grows until it completely consumes him. While the stock J-horror characters - such as the four-eyed stalker and the normal old man who is creepier than he seems - are present, Hayakawa never goes for a cheap scare with a loud music cue or gore. Instead, the writer/director slowly gets under the audience's skin with atmosphere. Shot in the snowy city of Sapporo, the film feels all the more chilling thanks to its wintry setting. Furthermore, the various overhead shots of the city's square grid and its buildings help add to the myth of the titular character, never letting the possibility of the Wall Man's existence out of the audience's sight. While the film is elegantly shot in a clean gray palette, Hayakawa's stylistic choices also make the film potentially more alienating. Every line of dialogue only furthers the film's thematic agenda. The concept of the Wall Man is linked again and again to the idea of media and the role of its audience as voyeurs - eventually to the point where it overtakes the film's basic requirement to scare audiences. 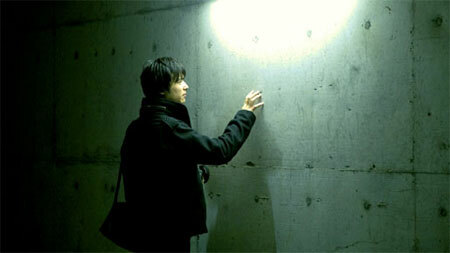 Hayakawa doesn't deny the Wall Man's existence, with numerous shots showing the Wall Man's perspective. The audience frequently observes people's lives through walls and the Wall Man apparently has the ability to change the channels on Nishina's TV. At the same time, by never actually showing the creature, everything simply boils down to redundant philosophical talk about what he is and who he is. In the end, The Wall Man possesses too much talk and not enough visuals to get the audience involved for the entire film. Those who buy the idea of the Wall Man as more than just a horror film creature may find the ideas intriguing, but most will simply find themselves alienated by Hayakawa's intellectual exercise.